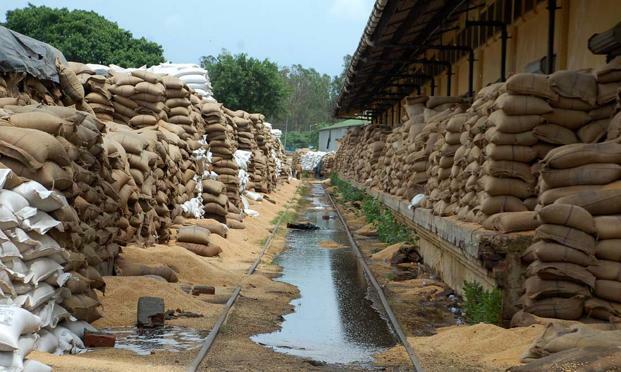 New Delhi : Around 62,000 tonnes of food grains, mainly rice and wheat, have been damaged in the last six years in the storage facilities of Food Corporation of India (FCI). According to an RTI reply given by the Ministry of Consumer Affairs, Food & Public Distribution, 61,824 tonnes of food grains were damaged between 2011-12 and 2016-17, with the maximum damage of 24,695 tonnes reported in 2013-14. The RTI petition was filed by social activist Ram Gupta. Sources said there are various reasons for the damage of food grains, including pest attacks, leakages in godowns, procurement of poor quality stocks, exposure to rains, floods and negligence on the part of the concerned persons in taking precautionary measures. As per information provided by Minister of State for Consumer Affairs, Food & Public Distribution, C.R. Chaudhary in the Lok Sabha recently, as many as 31 officials were found to be responsible for the damage during 2015-16. Action has been initiated against them. Admitting to the problem, he said the damage cannot be directly attributed to the lack of storage facilities. “Procured food grains are stored by the FCI in a scientific manner in covered godowns and cover and plinth storage. We follow scientific codes of practices for safe storage of food grains. In spite of all the precautions, some quantity of food grains get damaged and (are) non-issuable,” he added. It is to be noted that the country has a total storage capacity of 811 lakh tonnes for Central pool stocks, which is much more than the capacity required. In 2016-2017, the required capacity for Central pool stocks (stock position) was 534 lakh tonnes. The government has also issued guidelines for the disposal of damaged food grains. Accordingly, the FCI plans to sell from its various depots, damaged food grains (mainly wheat and rice) unfit for human consumption as manure, feed for animals and for industrial purposes.